With a 12-2-3 season record, the Franklin & Marshall Men’s Soccer team was bound to make it into the 2016 Centennial Conference playoffs. Where exactly they would fall in relation to the other Conference teams however, was the question. On Saturday, October 22, the Diplomats faced off against Haverford in an edge-of-your-seat kind of game. They were able to secure a 1-0 win in a dramatic overtime thriller. The Diplomats put themselves in prime position for a run in the Centennial Conference playoffs. F&M’s Jeremy Levine, Conor Pellas, Matt Regueiro, Dave Reingold, and Ben Wild were all honored before the game on the Diplomat’s Senior Day. With a 0-0 deadlock in the first 90 minutes, the Dips entered overtime to secure the win for their seniors. Less than five minutes into overtime, a throw from F&M’s Ben Draheim into the box caused chaos for the Red Devils. 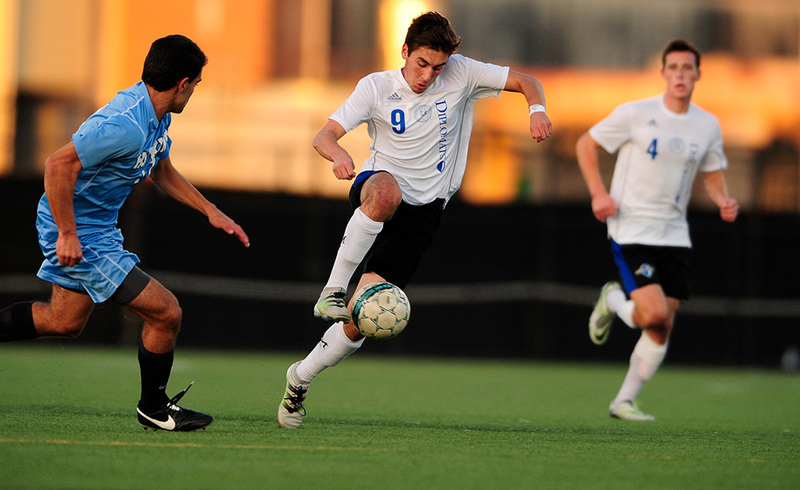 F&M’s Wyatt Fabian sent a cross to Robert Maze who placed the ball in the center of the net for the 94th-minute goal that the Diplomats needed to secure the win. Senior goalkeeper Dave Reingold added to the win with four game saves to make up his sixth shutout of the season. While the Dips’ Senior Day proved a promising future for the remainder of their regular season, this past Saturday, in a game against Dickinson, F&M faced defeat for the second time this year. Losing 2-1 to the Red Devils, Dickinson’s upset caused the Dips to fall to the No. 2 seed in the playoffs, followed by Johns Hopkins as the No. 3 seed, Washington as the No. 4 seed, and Dickinson as the No. 5 seed. The Diplomats played against the No. 3 Johns Hopkins this past Saturday at 1:30 pm and won on penalty kicks 4-3 after two halves and overtimes were not enough to settle the differences between the two teams. The Diplomats have had a fantastic season and the entire Franklin & Marshall community is proud of their accomplishments this season. They face off with Haverford for the right to call themselves champions this Sunday and we hope they are able to bring home the title back to campus. First-year Gabby Goodwin is a layout assistant. Her email is ggoodwin@fandm.edu.